Understanding how an electric car works can be rather an overwhelming research process. Without having an Electrical or Mechanical Engineering Degree, understanding what a kilowatt or a lithium-ion-polymer battery or a synchronous AC motor is can cause quite the headache and some extensive Wikipedia look-ups. I mean, I barely know how my iPhone works just so I can continue my Candy Crush addiction. So I’m going to try and keep things simple, for my own sanity. Kia is jumping into the electric slide band wagon and has introduced the all-electric Soul EV. Compared to the current generation Soul there are subtle differences to distinguish the EV badging such as the plug-in port on the front grille, projector beam head lights with LED accent lights, groovy shaped LED taillights and funky 16” white wheels. Our sampled Caribbean Blue over Clear White Soul EV was the top trimmed Plus model that featured front Projector Beam Fog Lights, Front and Rear Park Assist and Power Folding Side Mirrors. The battery pack used to power the Soul EV consists of 192 cells in eight modules that is nestled right under the first and second row seats. This adds nearly 620 pounds over the current generation’s gas powered Soul. Five transverse subfloor beams had to be added to strengthen the chassis which makes for a pretty heavy Soul at nearly 3,400 pounds. To get the front wheels going, the Soul EV uses a synchronous AC motor (similarly found in other electric cars), which is good for 109 horsepower and 210lb-ft of torque using a single-speed transmission. During our duration, using the 6.6-kilowatt on board charger, our Soul managed to achieve 105 miles of range (MPGe). EPA rates the Soul EV at 120 MPGe city and 93 MPGe highway with a combined average of 105 MPGe, seems we hit their mark. The Soul EV includes two charging ports an SAE J1772 and a CHAdeMO DC fast-charge port. Depending on your battery usage, it could take up to 10 to 12 hours to charge using a typical household 120 volt outlet, using a 230 volt outlet time may vary from 4 to 5 hours or half an hour at a public DC fast charging station for an 80% charge. Driving the Soul EV is no different than a normal Soul – its zippy to 60 mph in under 11 seconds, but we can’t imagine there is going to be a ton of hard acceleration. The extra weight helps in the driving dynamics, the chassis feels more solid, there is minimal body roll and the steering feels more precise and responsive. You can adjust the feel of the steering from Sport, Normal, & Comfort. The suspension provides a comfortable ride and because there is no noise from the engine, it’s fairly quiet in the cabin outside of the normal tire and wind noise. The standard Soul EV comes comfortably equipped with Automatic Climate Control, Navigation, Push Button Start, and heated seats. Our sampled Plus model added gray leather interior, heated and ventilated front driver and passenger seats, heated rear seats and a heated steering wheel. The only option fitted to our tester was plush carpeted floor mats for $125. We find the interior fairly retro and fitting for the Soul EV. The gray dash with white accents and leather seats with blue contrast stitching add a groovy feel and the digital TFT gauges give it that techno spice. The seats are decently supportive and since the rear seats were raised about half an inch for the battery pack, there is decent thigh support for rear passengers. When you start talking about prices for an electric car, they’re not cheap and when it comes to the Kia Soul EV, it’s much the same. The base Soul EV starts at $33,700 (before the $800 destination), our sampled Soul EV Plus adds $2,000 for $35,700. However these prices start to dwindle down with government subsides like the $7,500 federal tax rebate and California offers a $5,000 rebate. So you can get a Soul EV for practically the same cost as a top spec’d gas powered Soul Exclaim – which isn’t half bad. The downside is that the Kia Soul EV will only be sold in California for the time being – so if you want one, you might have to pay a little more to have one delivered to your state. With the Kia Soul EV being our first electric car, we had to take a different approach to our driving methods. In parking garages or lots, pedestrians don’t hear you coming so they’ll tend to jump out in front of you and have to be prepared to stop. Going from something that gives you 300, 400, or even 500 miles of range to something that only has 100 miles, you start to limit your destinations and choose them by whether or not there is a charging station – just something to bare in mind when in the market. The generation of ugly futuristic electric cars is behind us and we’re happy to see Kia putting some new light into its electric Soul. 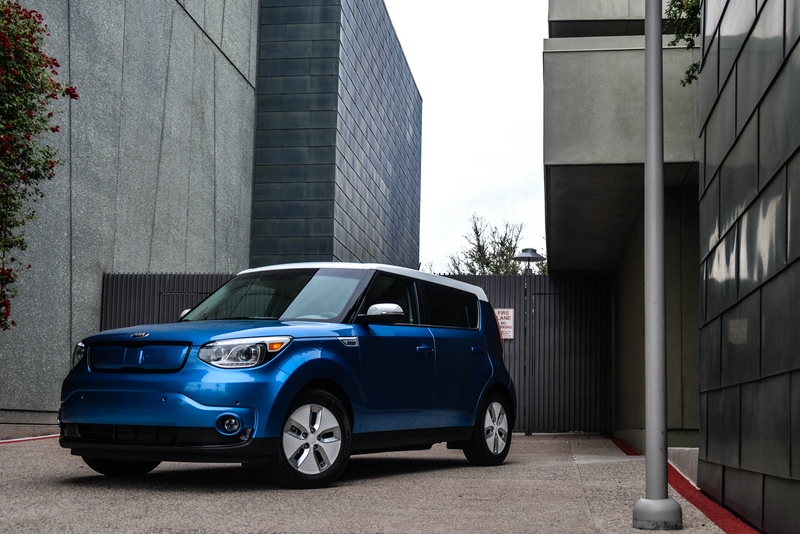 The Soul EV is a great little car with tons of room and features to love – plus driving in the carpool lane is always an added bonus.